Every Position (shape) you hold and motion you make creates an electromagnetic change in the body . Each position has an equal and opposite effect with both the body’s inner chemical forces and external atmospheric forces. Your body is an electromagnetic generator and switchboard connected to an organized lattice of life giving elements and minerals. For the generator to run it must absorb constantly. Information in the form of elements and minerals. Elements are forces that includes sub forces of minerals, particles and other elements that engage only in that precise position and direction the body takes when needing that element. These position have emerged from my lifetime of study in the forms and forces of the Martial Arts and their application to transformational healing and wellness. The chemical effects and systemic transformation from these forms can be both precise and dramatic. Each position applied to the corresponding direction, stimulates, nurtures and strengthens different systems as well as shifts the frequencies of the muscles, bones and brain. These are five more from the series of 8 that will be available through the online course and in person workshops and trainings. The Infinite 8 are designed to balance, strengthen and heal your entire system. 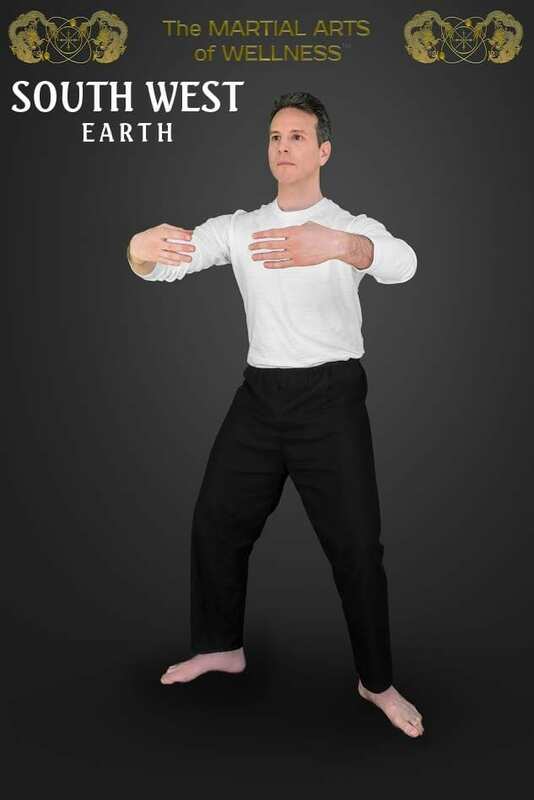 EARTH (SOUTH WEST) “Mountain Secures Space"
The Earth position engages fields that stabilize, strengthen and straighten the body through the effect of gravitational forces. By achieving a strong connection with gravity many conditions related to inflammation and dampness can be dispelled. Strengthens and aligns the entire spine through stabilizing charges in the bone tissue and creating coherence with the earth’s fields. Coordination of Musculoskeletal, Cardiovascular, Limbic system, Central and Peripheral Nervous System, Vestibular and Digestive system. • Resetting the nervous system to homeostasis using coherent magnetic rhythms. • Resetting circadian rhythms from jet lag or PTSD. • Equalizing brain hemispheres through balancing cerebrospinal fluid. • Digestive health for hypo and hyper-acidity. • Position of lungs, neck and tailbone helps to reposition prolapsed organs. • Cardiovascular health — balances hemispheres of the heart and releases excess pressure on arteries. Balancing heart rhythm due to neck and arm position. • Restores mobility through reactivating kinetic muscle chains in spine through electromagnetic pulses. • Stabilizing for hypermobile joints. • Adduct ankle bones to center the tailbone. • Lift ribcage to the sky while directing pelvis downward. 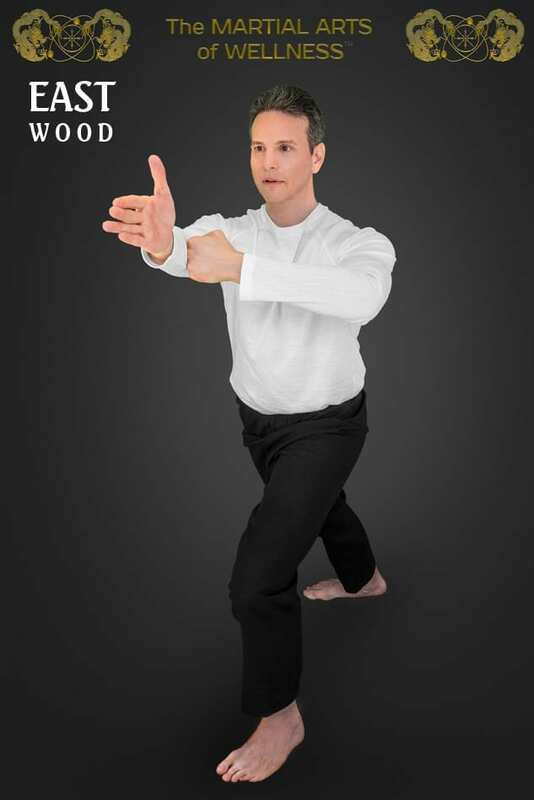 WOOD (EAST) "Righteous Sinew Expresses Eternity"
Strength of Liver/Gallbladder, ligaments, tendons and all connective tissues controlling elasticity of bones and organs. Stabilizing and strengthening the regeneration capacity of the body. • Balancing and stabilizing the body’s active energy resources. • Calming and disbursing digestive heat and pathogens. • Helps stagnant blood move through areas of inflammation. • Regeneration of ligaments, bones, nerves and neuropathways. Rising Above, Determination, Flexible motivation. • Project chest energy up and forward. • Tense entire fascia and ligament sheath to direct current through the right hand and foot. WATER (NORTH) “Drop of Stillness Pierces Force"
NATURE — Stillness, Absorption, Fluidity. 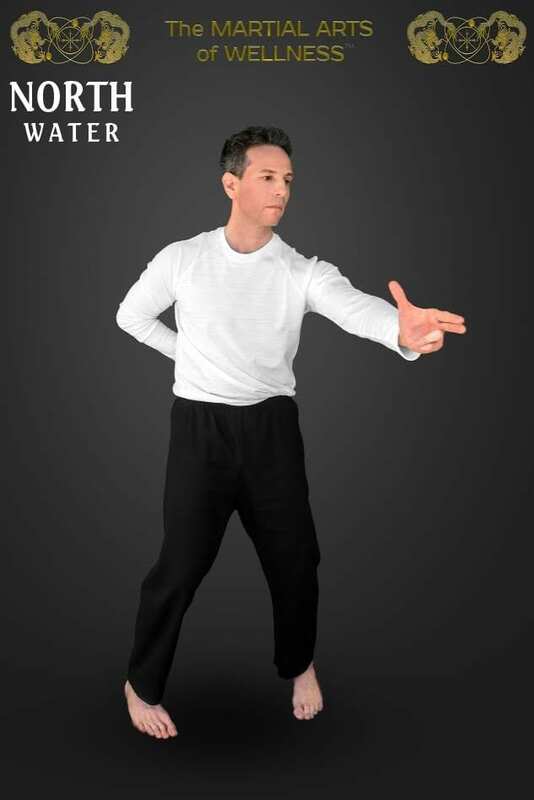 The Water position engages fields and elements for replenishing chemicals, hormones, marrow and blood, by enhancing the bodies absorption capacity. Strengthen the lower back, hips and knees and the body’s ability to recover rapidly from workouts. • Delivers elements and chemical messengers to cool and replenish the body. • Detoxification of kidneys and adrenals. • Strengthening of kidneys and adrenals. • Reduction of inflammation due to injuries, diabetes, toxins and infections. • Helps with vertigo, ADHD, PTSD, balance and eye strain, headaches, migraines. • Fertility and Erectile dysfunction. Depth perception, Relaxed Mind, Strengthens compassion and Understanding. • Twist the spine and obliques to squeeze the kidneys. • Direct ligaments inward and downward.